Solo un prototipo existió. 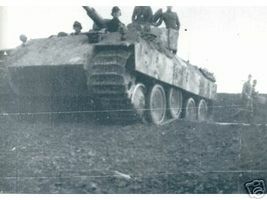 La torreta del PzKpfw IV se montó como módulo estático en un chasis de Panther para pruebas. 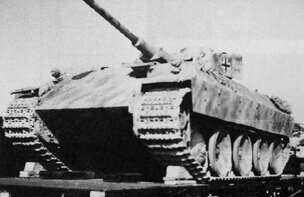 It's based on a Pz.Kpfw. V Panther hull with the stock turret from the Pz.Kpfw. IV. 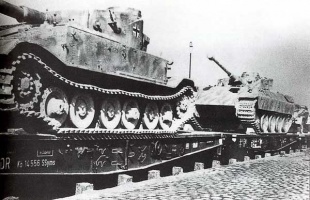 Many players think it's similar to a buffed Pz.Kpfw. III/IV. It has great mobility, decent acceleration and is well armored for its tier. Its weakness, however, is that it has very little gun depression, so in hilly terrain it's at a large disadvantage because even a small bump can make a big difference in its ability to hit the target or not. As a result, it's best to fight on flat ground, though some very small tanks are still difficult to hit, even on flat terrain. It's recommended to always flank and target the enemy's rear and side. Very fast in a straight line, even faster than some light tanks!. High P/WT ratio means quick acceleration. Heavily sloped frontal plate can bounce many at tier and occasionally above tier shots. High RoF on the gun helps mitigate its mediocre penetration. Heavy weight combined with high top speed makes this tank a deadly rammer (even heavies will take significant damage!). Very poor gun depression from the front (Fairly good from the side, though it is risky). Very tall and easy to spot. To be effective,use his tank as a flanker. Use its speed, maneuverability, and turret traverse to circle stray enemies. Attack the enemy from the sides and rear. If possible, try to time your flanking attempts to occur while your target is busy fighting one of your allies. Neither the armor nor the gun is strong enough to engage in most prolonged face-to-face battles. This tank is best positioned in a wolf pack with other mediums. It is good in hull down positions if you can place yourself behind hard cover - on flat ground - due to elevation limits on the gun. In close combat players, should try to track the enemy and then go for weakspots behind the enemy tank.